The Mechan S-TYPE switches are electronically operated standalone safety switches designed to work with any safety relay. 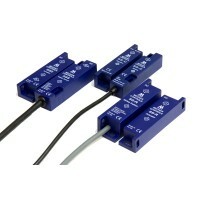 Based on the Mechan top of the range F-Series electronics, the S-Type safety switches uses Mechan’s unique frequency operated switching system. This ensures only the Mechan S-Type actuator can operate the switch stopping unauthorised overriding of the safety switches. Ideal for replacing standard magnetic safety switches where additional security / reliability and indication at the switch is required.